AIR investigates action and intention recognition in human interaction with autonomous systems (or AIR, for short). More specifically, the focus is on the interaction of humans and autonomous systems that move in shared physical spaces. The mutual recognition of actions and intentions between humans and the autonomous systems they interact with is absolutely crucial to ensure safety as well public acceptance of such technologies. Therefore, the research to be performed within the AIR distributed research environment will contribute to the success of future autonomous systems in society. Addressing the challenge of mutual action and intention recognition therefore requires a well-coordinated long-term interdisciplinary research effort that integrates expertise in cognitive science, experimental psychology, human factors, human-machine interaction, robotics, computer vision, and artificial intelligence – as constituted by the AIR consortium. The goal of this project is to develop teleoperated robotic platform capable of doing variety of tasks in the additive manufacturing cell, while being supervised and teleoperated by a human operator. In this scenario, the operator is isolated from the hazardous environment, but the complex task can be performed using operator’s knowledge, skill, and intelligence. Jan 1, 2017 – Dec 31, 2019 funded by the European Comission (EU H2020 RIA). Today, intralogistic services have to respond quickly to changing market needs, unforeseeable trends and shorter product life cycles. These drivers pose new demands on intralogistic systems to be highly flexible, rock-solid reliable, self-optimising, quickly deployable and safe yet efficient in environments shared with humans. ILIAD project focuses on developing robotic solutions that can integrate with current warehouse facilities, extending state of the art to achieve self-deploying fleets of heterogeneous, human aware, safe robots in multiple-actor systems for extended periods of times. Scientifically, ILIAD pursues ambitious goals for complex cognitive systems in human environments beyond a specific use-case, primarily focusing on tasks related to safe human-robot interaction resulting in socially normative robot actions. Furthermore, the project will also address the problems related to integration of task allocation, coordination and motion planning for heterogeneous robot fleets. funded by the European Comission (EU H2020 RIA). SmokeBot is driven by the application needs for robots that operate in domains with restricted visibility. 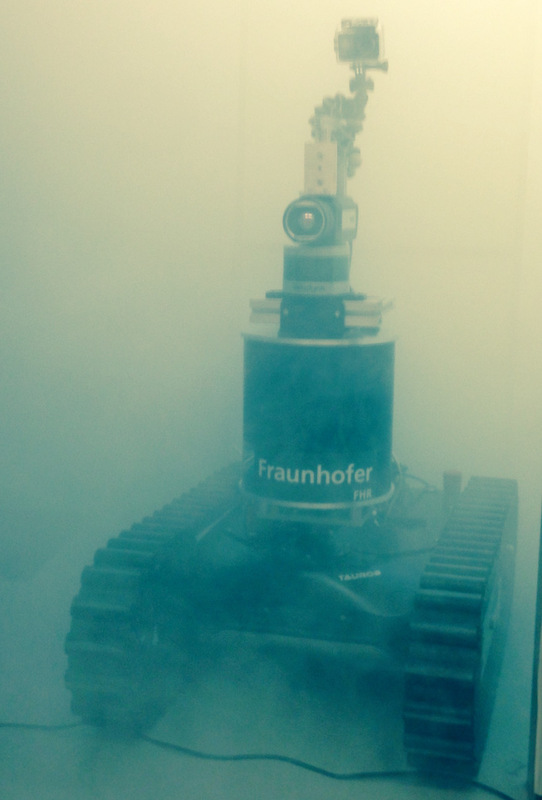 The focus is on civil robots supporting fire brigades in search and rescue missions. Existing sensor technology and the related cognitive approaches cannot cope with such demanding conditions. SmokeBot addresses this shortcoming and can thus bring about a step change for robotics. It will deliver software and hardware components which facilitate robot systems to perform under harsh conditions of smoke, dust or fog. The ability to operate under low visibility conditions will be demonstrated through integration of the project results in an industrial prototype of a Low Visibility Explorer Robot for providing situational awareness based on a commercial platform from partner taurob. An even wider impact is expected through the development of a novel sensor unit and the corresponding cognitive approaches. Sensor technology from SmokeBot will result in new products to be brought to market after the project. Software developed will be made available as open source. Building upon our internationally recognized research in robot vision, rich 3D mapping, techniques for higher-level perception and task planning, we have initiated a research effort towards the unified development of Semantic Robots: such a robot uses a multi-semantic model of its environment that can be tailored to its action and perception capabilities in order to automatically derive and execute action plans that achieve given goals. SURVEYOR is a pre-study (6-month) project aimed at improving the work space in foundries by using a better ventilation surveying approach. While indoor ventilation is critical due to the health and safety concerns associated with ambient air quality, current surveying techniques are overly simplistic and do not provide plant operators and occupational health specialists with accurate information regarding indoor airflow. Rather than relying on sporadic measurements and simplistic models, the proof-of-concept system in SURVEYOR addresses ventilation surveying using a mobile robot, static sensing nodes and advanced statistical modelling algorithms. SURVEYOR will be developed in cooperation with Johnson Metall AB and Global Castings Guldsmedshyttan AB. SURVEYOR is funded by the strategic innovation programme STRIM (Strategic innovation programme for the Swedish mining and metal producing industry) which is part of a joint investment in strategic innovation areas (SIP) by Vinnova, Formas and the Swedish Energy Agency. Find a complete list of past collaborative research projects here.